2018 will be remembered by team Coutelou for mildew, hail, mechanical breakdowns and successive problems. Yet as we reached the end of the vendanges the habitual feelings of pride, camaraderie and friendship were to the fore. Though the harvest of Mourvèdre the previous week was the last of the major parcels Jeff had left grapes in Peilhan to pick. The reason was a visit by a film crew from Netflix making a programme (or series) about different ways of making wine in the region from cave co-ops to big scale producers and négotiants like Bertrand to the natural producer which is Jeff Coutelou. Carignan Blanc and Muscat D’Alexandrie was picked in the morning, even I did 4.5 hours of picking. Over the final harvest lunch (my favourite Fideua plus jeroboams of the first Amphora wine) the crew joined us and then filmed the afternoon picking of the new plantation of Peilhan with its Piquepoul Gris and Riveyrenc Gris. They shot scenes in the cellar as we sorted and then carried out a long interview with Jeff. I am not really allowed to say much more until the broadcast and shall update when we get the date. And that was it. The last grapes. There remains much work to do with the processes I described here needing to continue for all the wines in tank, from the first to these last. The Muscat will go to make a maceration orange wine as in 2016, a wine I truly love and which has featured regularly through harvest lunches. It is time for Jeff to count the costs of these vendanges in terms of actual production and I shall feedback when things settle down. Suffice to say we had a big drop in quantity, the Coutelou wines will be even harder to find. Having tasted most, if not all, as they ferment steadily I can say that quality remains high, Flower Power, Carignan, La Garrigue Syrah and Mourvedre especially. Jeff’s motto of “grapes, work and love” is never more true than at this time of year. We have worked hard, we have formed friendships and made the best of what nature gave. Categories: Vignerons, Vines, Wines | Tags: Carignan Blanc, Coutelou, Mourvedre, Muscat d'Alexandrie, Peilhan, Piquepoul Gris, Riveyrenc Gris | Permalink. An unusual few days to report upon. Let’s start with some bad news. Twice in the last week people have dumped their rubbish in Jeff’s vineyards. As these were at opposite ends of the village it must be assumed that there are two selfish, anti-social idiots who would prefer to spoil the local environment than drive to the local tip (déchetterie). Another unwelcome arrival was Hurricane Irma in the Caribbean. Jeff’s sister Catherine and her husband live on Guadeloupe so we were all concerned for their welfare. Happily she reported that the worst of the storm missed the island. Others may not have been so lucky of course. For me there was one more unwelcome visitor. As I entered the cellar on Tuesday morning I mentioned the smell of Carbon Dioxide in the air. This had built up from fermenting grapes and with the cellar being less busy than usual the CO2 had built up. As Tuesday was hot the cellar doors stayed shut as much as possible and with remontages and open vats the CO2 was strong. Alas it seems I am particularly sensitive to it and it made me breathless and nauseous. I can understand better how some people have serious accidents with gas build up when they are working at open cuves. Maybe it’s because I’m getting old but the others were unaffected, and I’m the non – smoker! Happily, I have soon recovered. Yet another visitor arrived in the form of the inspector who controls organic certification for Ecocert. 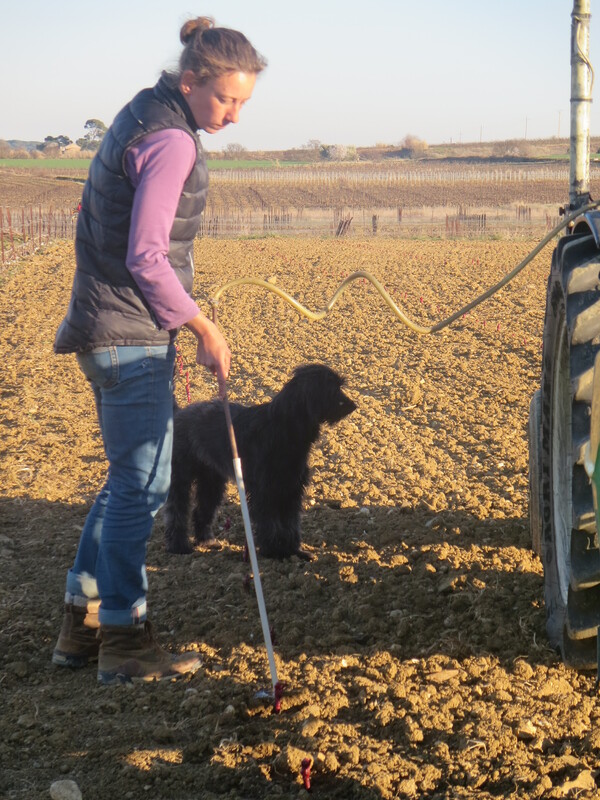 I wrote about her annual visit in 2014, this was a spot check during vendanges to ensure that everything is done following organic principles. Reassuring for those of us who want to know that Bio wines are truly organic. Obviously, there was no concern as Mas Coutelou goes well beyond the standards required. Animal visitors too. Buried in a case of Grenache from Sainte Suzanne was this 6cm caterpillar, quite a size. And, amongst the Carignan vines today was this dragonfly who was there with others and many butterflies. Which makes the actions of the fly tippers even more senseless. And so to grapes. More cépages to keep me happy. Piquepoul Gris and Terret Blanc along with Maccabeu picked from Peilhan on Tuesday morning will form a new white wine. The pink tint of the Piquepoul Gris will not colour the wine as it was pressed directly to remove the juice from the skins. 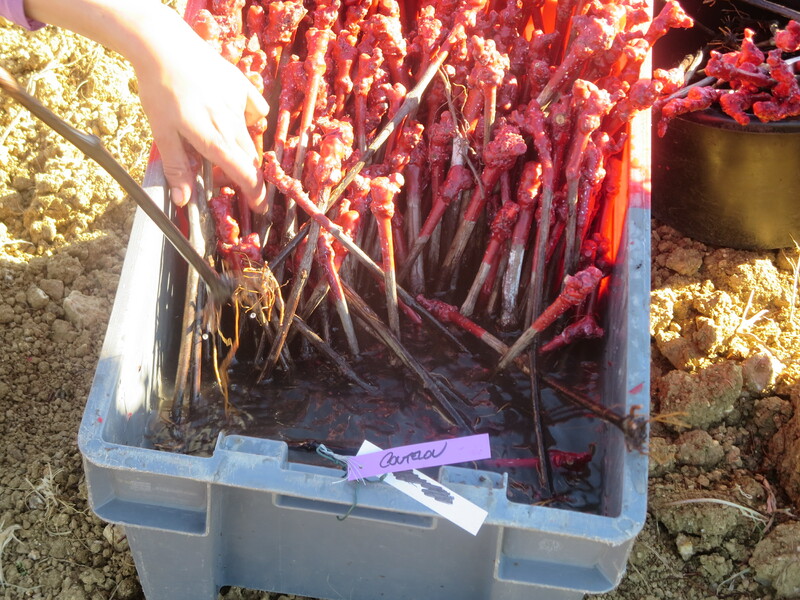 The aforementioned Grenache was supplemented with more Grenache on Wednesday this time from La Garrigue. So good was this harvest that Jeff is considering making a special cuvée with it. Together with the excellent Syrah from the vineyard La Garrigue has certainly performed well this year. Cinsault from Segrairals followed on. With smaller yields and dry weather the picking has been quick this year, efficient too with an excellent team working well. You will see in the photo below how they work in pairs across a vine to ensure that all the fruit is picked, hopefully avoiding each others’ fingers. So, what remains? Well probably five days of vendanges with Cabernet, Mourvèdre and Carignan still to come, the latter of course being the headline act in recent years. There are also a few rows of vines in Peilhan, eg the reds such as Oeillade and Castets and more Muscat too. All is set fair for a good finish. Categories: Vignerons, Vines, Wines | Tags: carbon dioxide, Carignan, Cinsault, Ecocert, Grenache, La Garrigue, Maccabeu, Peilhan, Piquepoul Gris, Sainte Suzanne, Terret Blanc | Permalink. As we approached the end of vendanges a number of the team were moving on. It was an inspired move to have a farewell day, picking, tasting and celebrating together, though we were already missing some like Charles, Carole and Maylis. The morning dawned over Peilhan and the vineyard which we planted in March 2015. 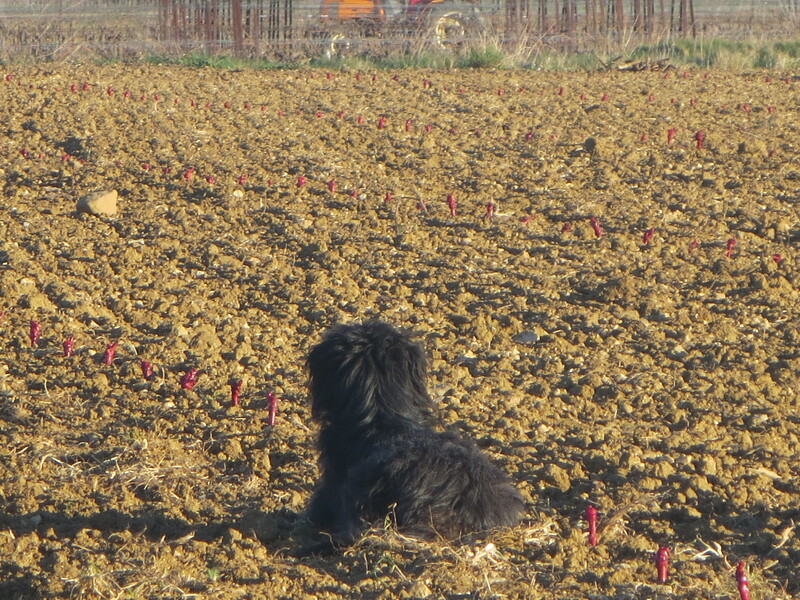 Rows of Terret Blanc and Noir, Riveyrenc Gris and Noir, Piquepoul Noir and Morastel produced grapes this year. They cannot be used in major cuvées sold to the public as they are too youthful. However, Jeff decided to pick them to make something for himself out of interest. So, on a bright, warm autumnal morning we gathered, picked, chatted and laughed. Interesting to see how some varieties produce more than others already, more precocious perhaps, the Terret Noir being especially shy. Altogether we picked around six cases only but there was a real mix of colour and some nice looking fruit which went into a small cuve in whole bunches. Later that day we gathered again, this time in the main cellar along with Thierry Toulouse, Jeff’s oenologue. We tasted through the whole range of 2016 wines in cuve before heading to a local restaurant for a meal. The results of the tasting were fascinating. Clearly, they are in a stage of transition, fermentations still progressing. Nonetheless the wines were already showing their character. I won’t go into too much detail here, though I did take notes to help me record how the wines change in coming months. In summary though I was amazed. I have said many times on here how difficult this year has been. A very warm winter, drought, mildew, delayed summer being just some of the problems. Yet here we tasted some lovely fresh fruit, lively acidity and other promising signs. I would mention the Carignan Blanc, lovely Syrah and Grenache from La Garrigue, juicy Mourvèdre and in particular the wonderful Carignan Noir of Flambadou. All those puzzles which Jeff had to hold in his head about harvesting dates, moving wines, possible assemblages etc, well those puzzles were solved in the glass. I had expected some disappointments but somehow Jeff has conjured some potentially top quality wines. At the end of the current wines Jeff also shared a 2003 bottle of white wine based on Grenache Blanc, Noir and Gris, called Roberta (it’s a long story!). This was one of three cuvées which were the first that Jeff made sans sulfites. Yet it was complex; fresh, fruity, nutty. A wine which made my heart sing, proof that SO2 is not required for ageing wines as we are often told. Perhaps in 13 years time we shall be tasting the 2016 wines and marveling at them too. A fitting way to close the vendanges period, a team rightly proud of what it had achieved. Categories: Tasting, Vignerons, Vines, Wines | Tags: Carignan, Carignan Blanc, Flambadou, Grenache, La Garrigue, Morastel, Mourvedre, Peilhan, Piquepoul Gris, Piquepoul Noir, Riveyrenc Gris, Riveyrenc Noir, Roberta, Syrah, Terret Blanc, Terret Noir, Vendanges | Permalink. 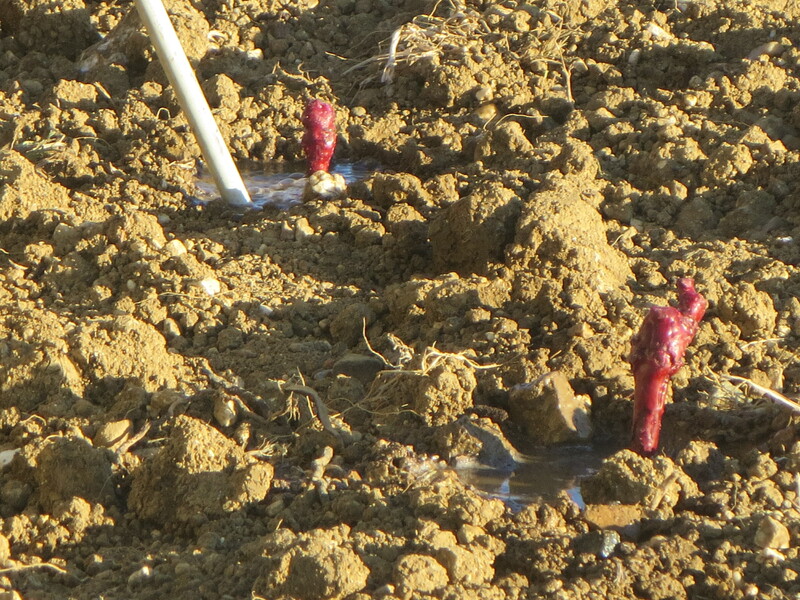 Friday March 6th brought a hot sunny afternoon and the birth of a new vineyard at Mas Coutelou. Well, a new section of vineyard at least. Peilhan is the most southerly of Jeff’s parcels and already contains a variety of grape varieties ranging from Carignan planted in 1992 to fairly new white grapevines such as Maccabeu, Grenache Gris, and Carignan Blanc. However, also planted are some rarer old varities such as Clairette Muquée and the Castets which I have so praised before. 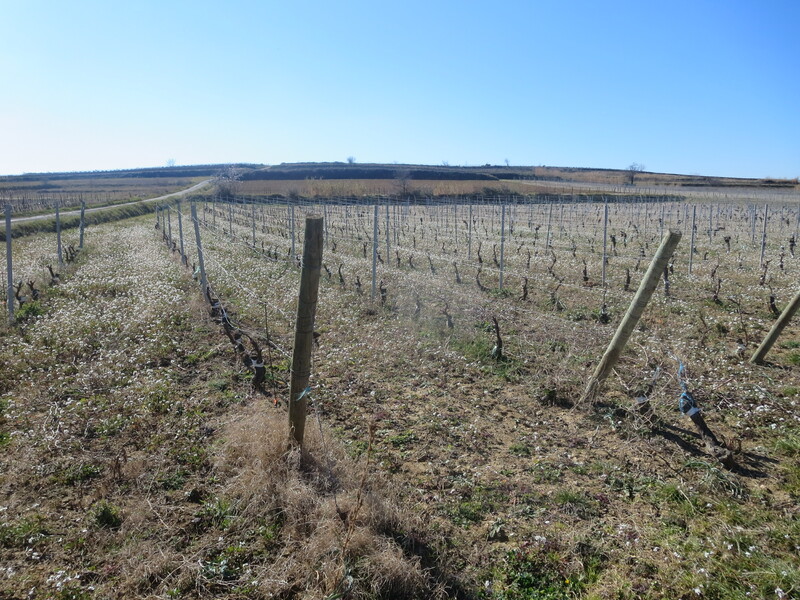 If you look in the photo towards the top you will see a sloping area of land just beyond the planted vines and it was this section which, after lying fallow for many years, was to be planted. I have highlighted it below. They would be planted as a mix to help resist disease as well as diversity. The plants are laid out ready, roots in water. Renaud, Michel, Carole and Jeff lead the way. Jeff, as usual, is on the phone as someone wants some wine! 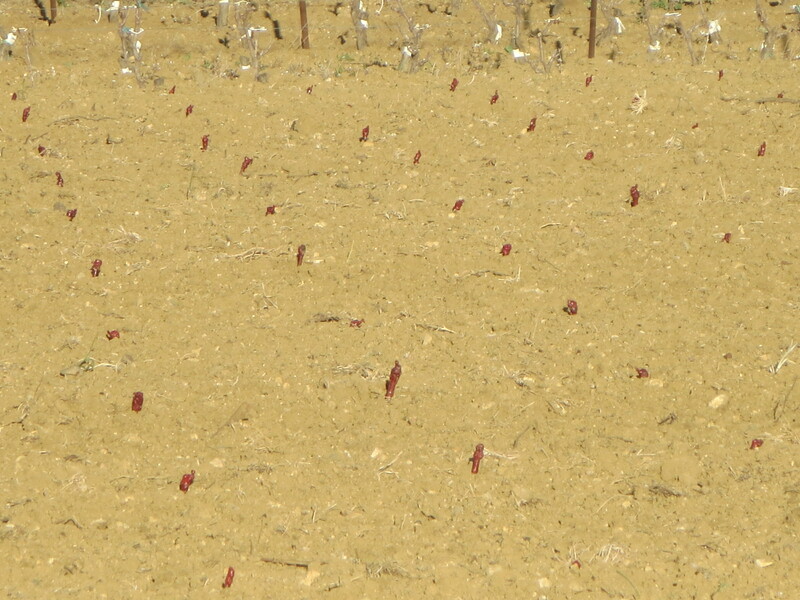 The vines came from a trusted supplier in Carcassonne and resembled large matchsticks. The vine foot is an American rootstock, the only ones capable of resisting the phylloxera beetle which almost wiped out French vineyards in the 19thC. 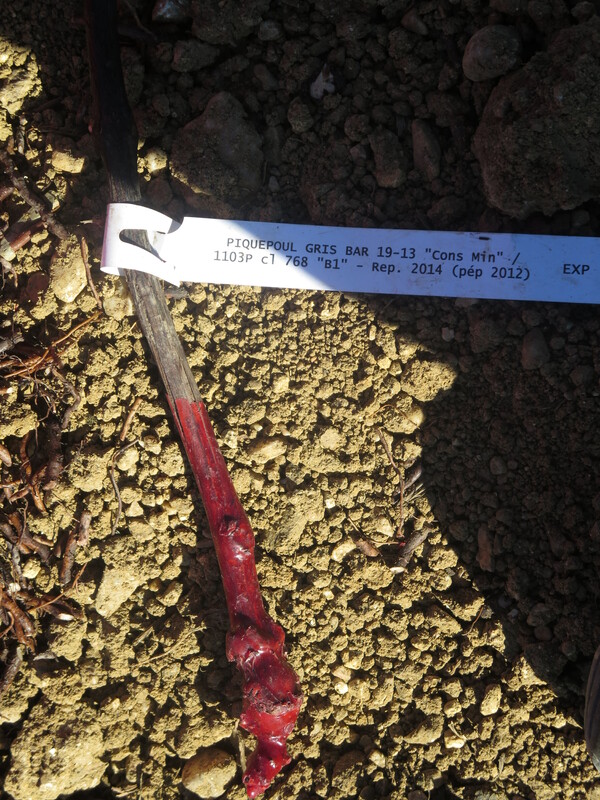 The plant is grafted onto this root stock and then covered with the red wax to protect the grafting stopping air getting between the plant and the root stock. The wax will fall away naturally in the next few days. As you can see they arrived with long roots and we had to cut these down to make them easier to plant. Jeff had hired two expert plantsmen to lead the way, the two to the right in the photo above. 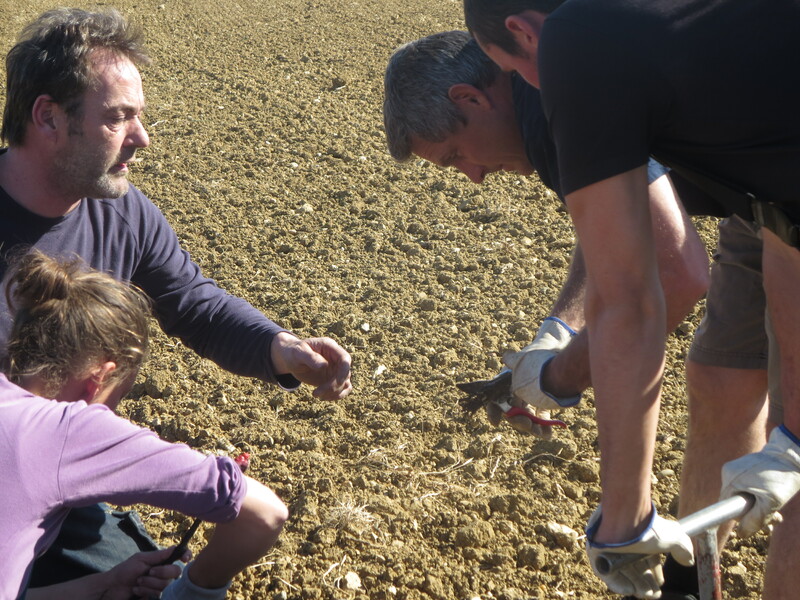 They demonstrated how short the roots should be and left Renaud, Michel and myself to carry on whilst Jeff and Carole (in the photo) went to help the planting. 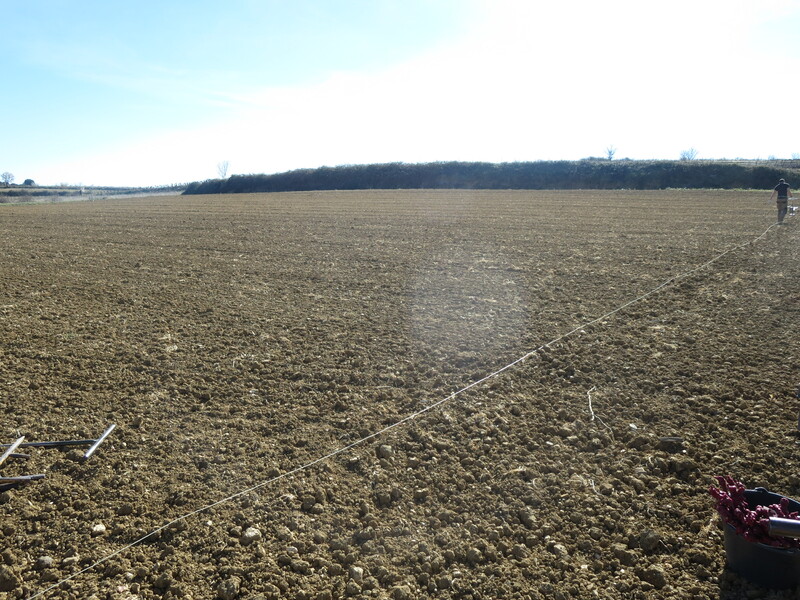 The field was marked out to show where the vines would be planted. 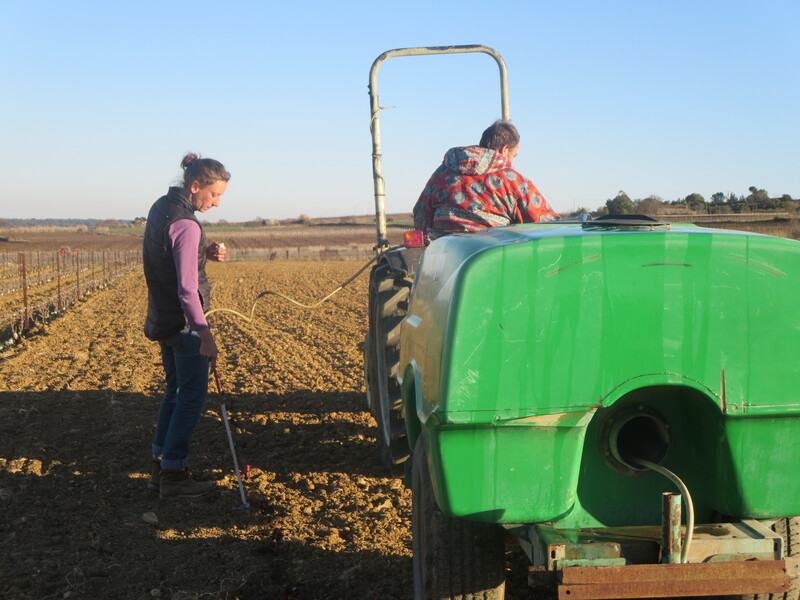 Each variety was to be planted at different intervals according to its specific needs, some need wider planting such as the Piquepoul Gris, others should be planted more densely such as the Terret Noir. The spaced to the right of the rope will be planted with hedges, including rose trees. These will provide shelter for birds and bats, natural predators of damaging insects and vers de grappe (worms) as well as providing a natural boundary to the parcel. 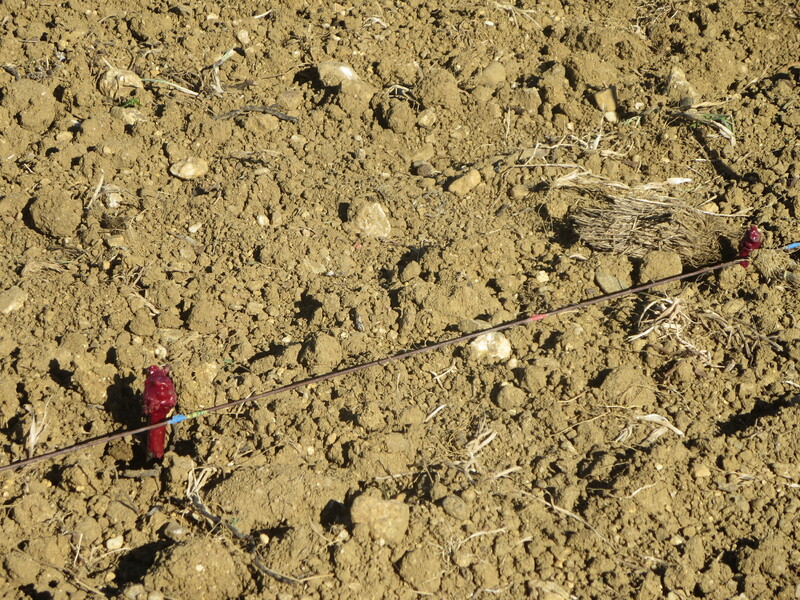 Wire cables ran along where each row was to be planted, in the photo you will see a blue mark where the vine was to be planted. 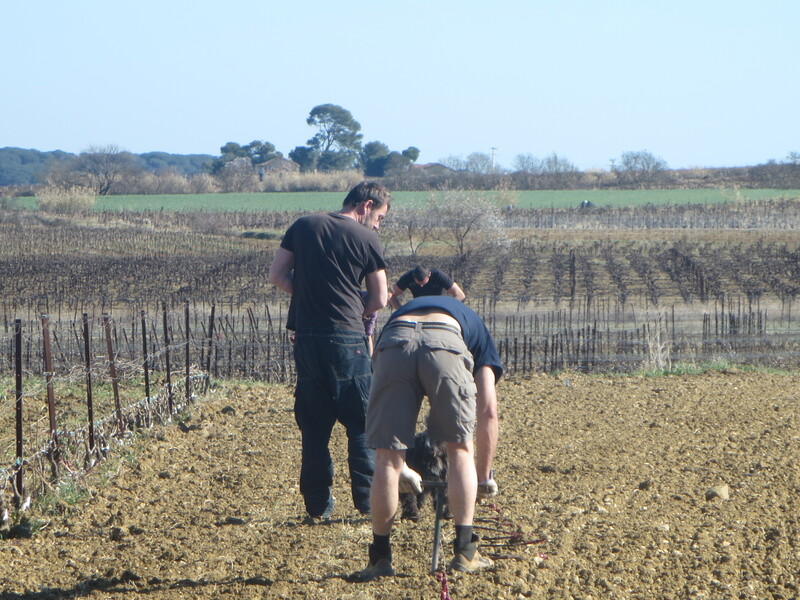 The two experts did the planting with Jeff and Carole (later Michel) dropping the vine for them to plant. This video shows just how fast they work, on a hot day it very impressive. There was a welcome beer break (with English beers from County Durham no less!) but the work continued solidly for 4 hours. The new plants need water of course so Jeff and Carole set to work. 1500 litres were used for 2 rows of vines! Jeff asked me at the end of the day what my thoughts were about the planting, how I felt about it. I had to think about it for a while. It had seemed like hard work but it was with a real sense of being present at a new beginning. The vines have a 99%+ survival rate and they will in a few years be producing white and red wine of great quality. And I was there for the birth of this project, a privilege. It was impossible not to feel excitement about what was to come and to wonder at how these small sticks would become beautiful vines. And to feel proud that Jeff is willing to plant something which reaches back into the past as well as providing for the future. Let’s hope we are here to enjoy the wine in a few years. 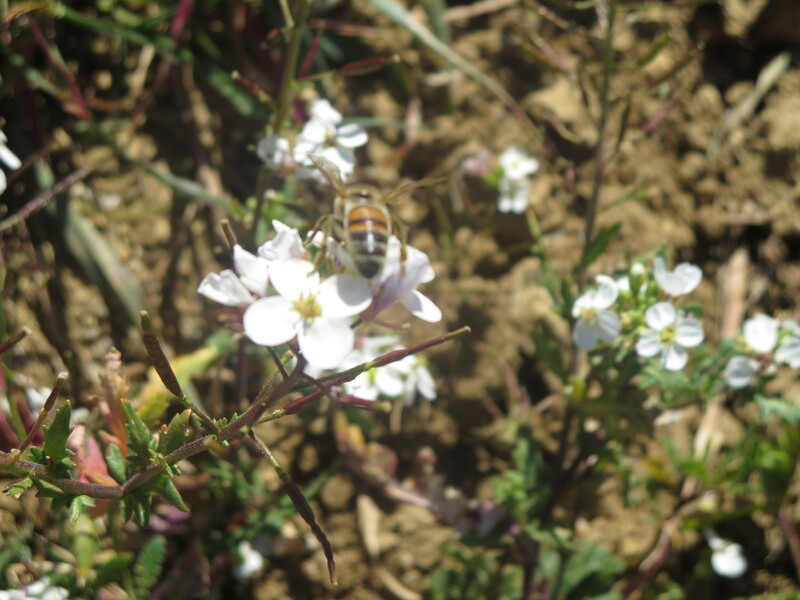 As if to crown my day of feeling close to nature I was able to take these photos of bees on the rocket flowers in the main parcel at Peilhan. 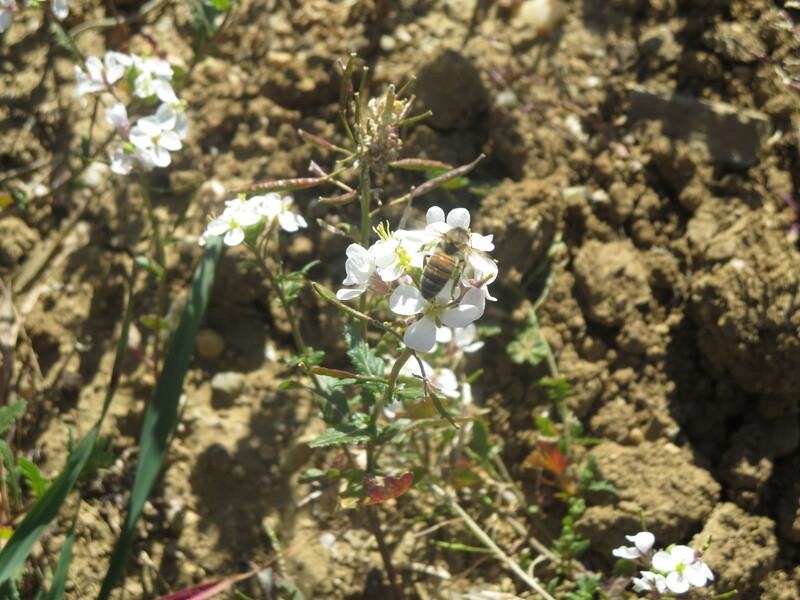 This is one corner of the Languedoc where nature still rules, with a little help. Categories: Vignerons, Vines | Tags: Carignan Blanc, Grenache Gris, hedges, Maccabeu, Morastel, Peilhan, phylloxera, Piquepoul Gris, plantation, Riveyrenc Gris, Riveyrenc Noir, Terret Blanc, Terret Noir | Permalink.